What started as a free browser-based space shooter from the twisted mind of Australian developer Jarred “Farbs” Woods has, with the help of the equally twisted minds of Pixelsaurus Games, been reborn as Captain Forever Remix. In this 2D rougelike you travel the cosmos blowing up randomly generated enemies, mining the resulting space debris for spare parts to create the baddest, raddest spaceship in this or any other solar system. You need a tough ship if you’re going to stop your little brother, the evil King Kevin, who has frozen the Sun, poked out Jupiter’s eye, drank Neptune’s oceans, and cracked Earth like an egg with the help of his mutant animal army. It’s a an epic adventure that has been given an appropriately epic limited edition boxed release through IndieBox. IndieBox is a monthly subscription service that gives indie games the big budget treatment, re-packaging them in a collector’s edition box and mailing them to your doorstep. Each IndieBox includes a retro-style game box, USB game cartridge, color instruction manual, original soundtrack and other collector’s items related to that month’s featured game, which are always Windows, Mac and Linux compatible. The service starts at $19.99 + shipping ($4 for United States, $9 for Canada and $14 for international) for a recurring 1-month subscription, which you can cancel at anytime. Of course, if you lock into a longer commitment, like a 3-month ($17.99/mo + shipping) or 6-month ($15.99/mo + shipping) subscription, you save some scratch. You can also purchase copies of previous IndieBoxes for $24.99 + shipping while supplies last. This is the best box art to date, and I mean of any box. The idea is that the space opera unfolding in Captain Forever Remix is actually happening inside the over-active imaginations of a brother and sister, running high on too much sugar and too many Saturday morning cartoons. This is perfectly captured in the cereal box-inspired art, a parody homage to the sugar-soaked, neon-colored, chemical-packed breakfast foods of the 90’s; Cinnamon Mini Buns are as far from Paleo as it gets. I loved that in addition to containing 110% of the recommended dietary allowance of fun, and 100% of lazers, cereal prizes and cereal nostalgia, it’s also got 5% salt. So, drink lots of water when playing! 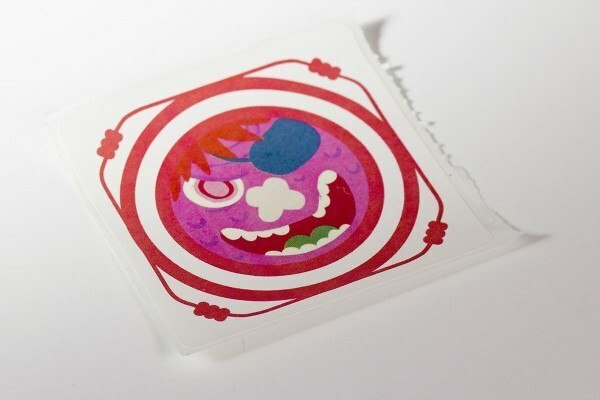 I thought the bullseye-esque design of this sticker – with the melting, mutated grin of evil King Kevin dead center – was cool. 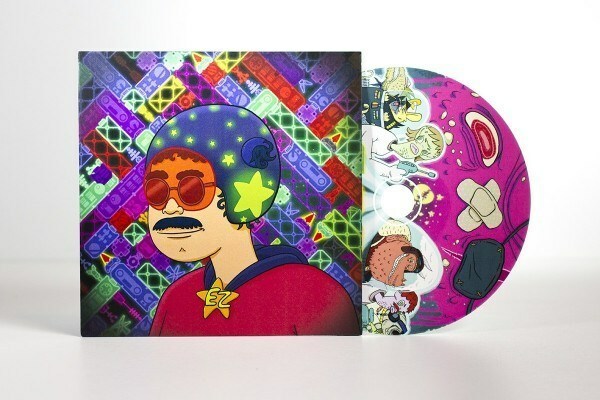 But even cooler is that scratching it releases a bubblegum-scented cloud of pure nostalgia. The only thing that made my mind-numbingly boring 5th grade social studies class bearable were the scented stickers on every aced pop quiz; years later, I couldn’t explain The Three-Fifth Compromise to save my life, but I could describe in vivid detail the look, the feel and most importantly the smell of every scratch and sniff sticker to ever grace a paper from that class. 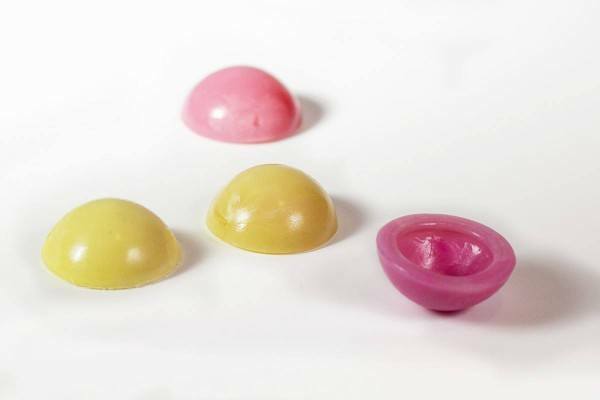 These plastic poppers – a.k.a. rubber poppers, a.k.a. jumping poppers, a.k.a. hopper poppers, a.k.a. eye poppers – were a popular toy the 90’s. They’re great for providing a practical demonstration in physics, as the molded rubber hemisphere stores elastic potential energy when inverted, causing the popper to fly into the air when the energy is released. They’re also great for making fake hickies. Not that I did that. 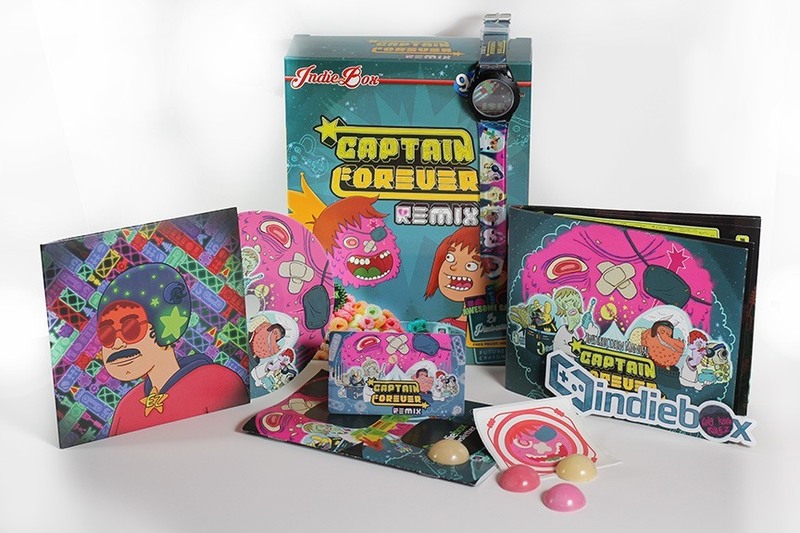 This is the big prize at the bottom of the cereal box – the Captain Forever Remix watch. 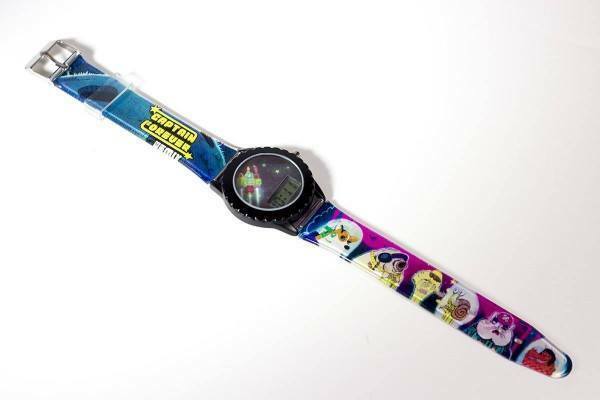 If you were scared that IndieBox was stiffing you with a scratch and sniff sticker and some rubber suction cups, then the quality of this Captain Forever Remix-themed watch will assuage your fears; despite the overall Swatch watch vibe, it’s not purely plastic. There’s a surprising amount of heft to it, thanks to the glass face and the metal surround, making it feel less cheap than it looks. Not that looking cheap is necessarily bad. The trashy, flashy graphics are what make this watch something I’ll actually wear. If only more designers would incorporate astro-corgis into their haute couture collections. Captain Forever‘s soundtrack, like its gameplay, was a rather austere affair. Not so for Captain Forever Remix, where composer Emeen Zarookian – of Dance Central and Rock Band fame – has overlapped tracks of bleeps and bloops to create a rich, psychedelic soundscape. It’s a sound parfait, and the awesome cover art is the cherry on top. This was one of the beefier instruction manuals I’ve seen in an Indiebox, probably because King Kevin has managed to recruit an entire army of ship-building, space-faring mutant animals. There’s Rachel the Cat, Kevin and Captain Forever (a.k.a. Natalie Norberry’s) pet who has been forced to choose sides now that they’re at war. There’s Dillon the pigeon, the most powerful space marine in the solar system who still can’t get a date. And then there’s Some Dog, a regular non-mutant dog that someone dressed up in formal military regalia and stuck in a space suit. And he doesn’t like it. At all. The art style is reminiscent of The Marvelous Misadventures of Flapjack, which is the highest complement in my compliment arsenal. And of course, you get a credit card-sized USB cartridge containing a DRM-free copy of Captain Forever Remix on Windows, Mac and Linux. The cartridge is covered in custom graphics cooked up by IndieBox’s graphic artist extraordinaire, CJ. He managed to work in Kristina the Tardigrade – the monstrous looking creature wearing off brand Beats on the far right – the first animal to actually survive in the vacuum of space. Seriously, Google “water bear.” There are 900 known species of these things. Known species. When they find one bigger than a poppy seed, it’s “game over” humanity. No IndieBox has better captured the spirit of a game than this one, its zany 1990’s Saturday morning cartoon vibe reflecting the wonderful weirdness of a game where you’re battling the mutant animal minions of a giant bubblegum-head with super powers. The cereal box is hilarious. The swag is nostalgic. The watch is awesome. This is the perfect example of why IndieBox is hands-down the best monthly video game subscription service out there.